A break in the windy, windy weather and out of the harbor we go, spending a night on the hook. Nice to take a quick swim and enjoy the view. The next morning we’re off to Man O’ War Cay, an island just 5 miles north. 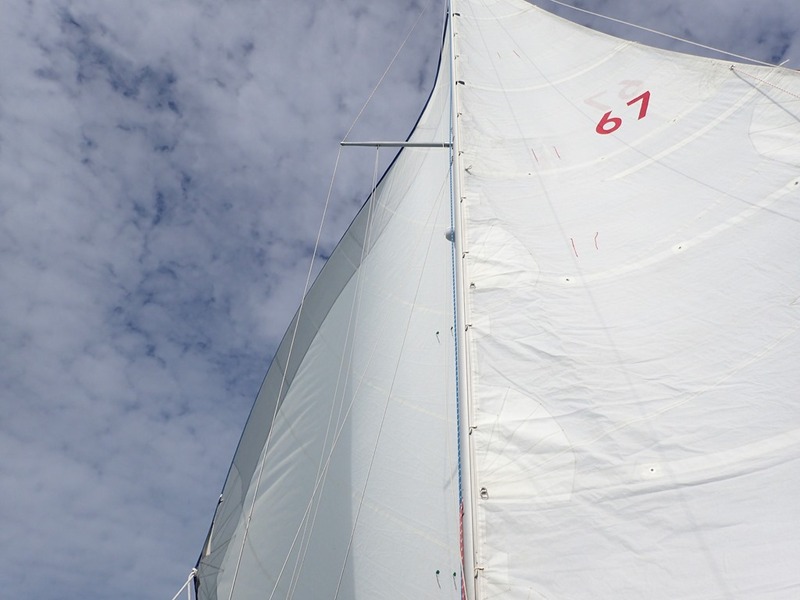 A relaxing downwind sail in a light breeze – wing on wing (the headsail on one side and the mainsail on the other). We take a mooring in the main harbor. 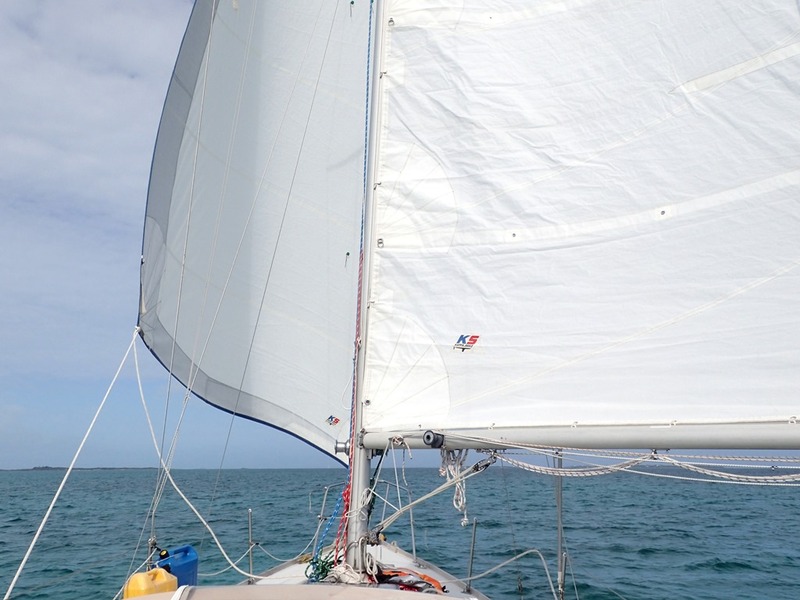 MOW is known for its boat building – traditional wooden Abaco dinghies and sloops and now fiberglass Albury runabouts. The best. 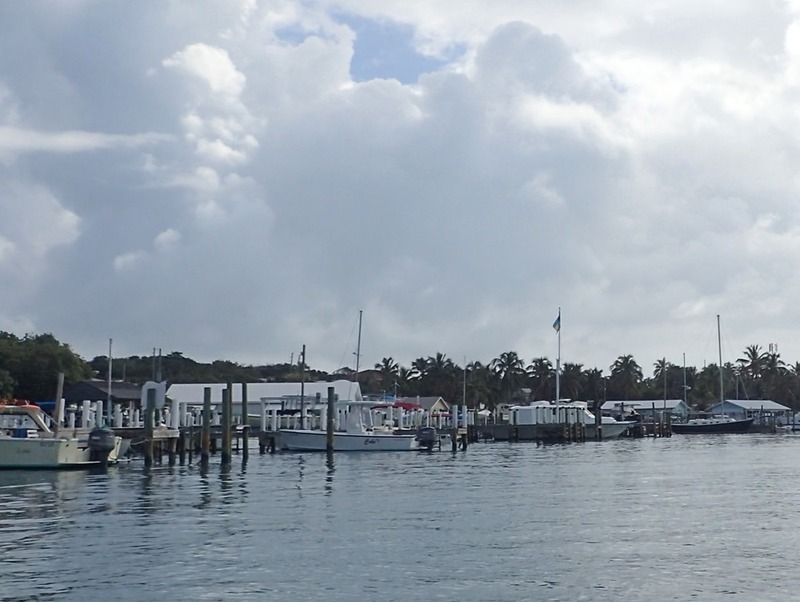 The settlement on MOW is on the north side of the harbor, with moorings between it and Dickie’s Cay, on the south side. MOW has a great grocery store, good-sized hardware store, and decent ship’s chandlery. Plus: Joe’s Studio (gift shop), the Sail Shop (canvas duffle bags sewn on the premises) and Sally’s Seaside Shop (fabric store) featuring Androsian fabric – brilliantly colored batiks hand-made on Andros Island, to our south. 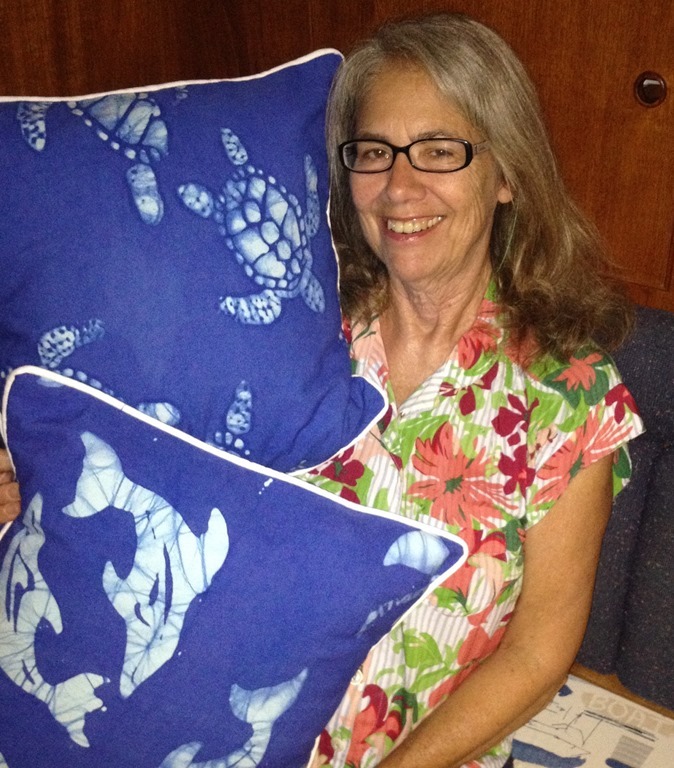 Here I am with two pillows, made of blue Androsian fabric, which I WON in Sally’s Christmas raffle and was finally able to pick up. Beautiful. 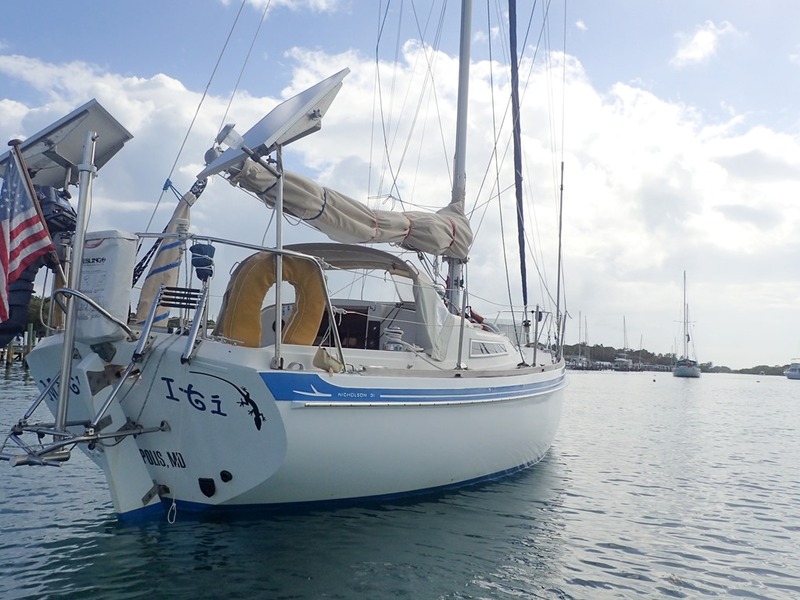 We were in he harbor for just minutes when friends who live there came over in their runabout. We had a great visit which included lunch at the Hibiscus cafe – wonderfully tasty and creative food. The sun set quietly – a tranquil evening. 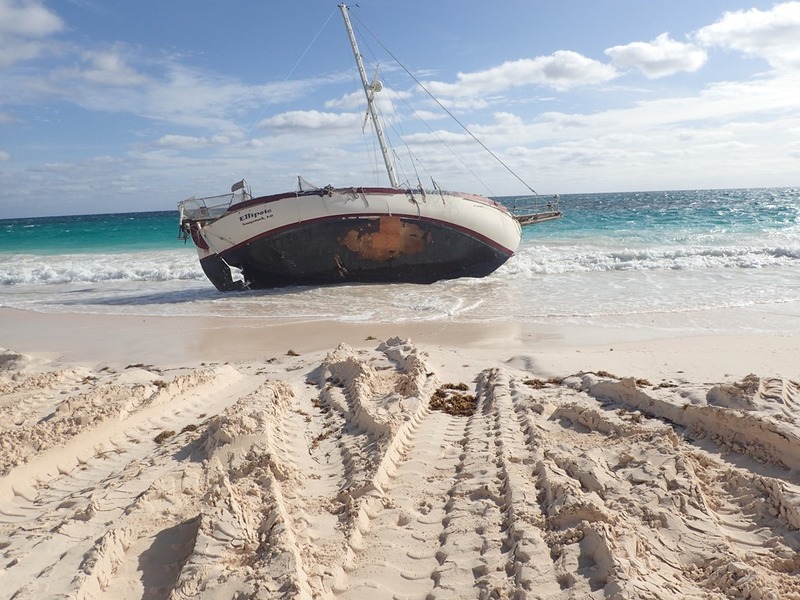 The next day we returned to Hope Town – a motor boat ride – no wind. 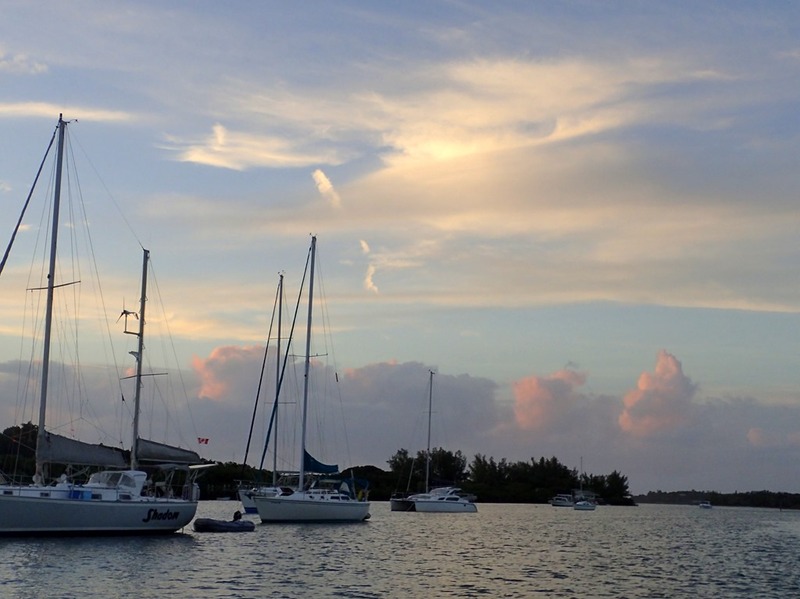 Rain clouds threatened, but we were on our Hope Town mooring just before the rain came. A fun little trip before the 30+ kt winds arrived — again. It’s supposed to blow over 25 for the next week. Rock and roll! P.S. 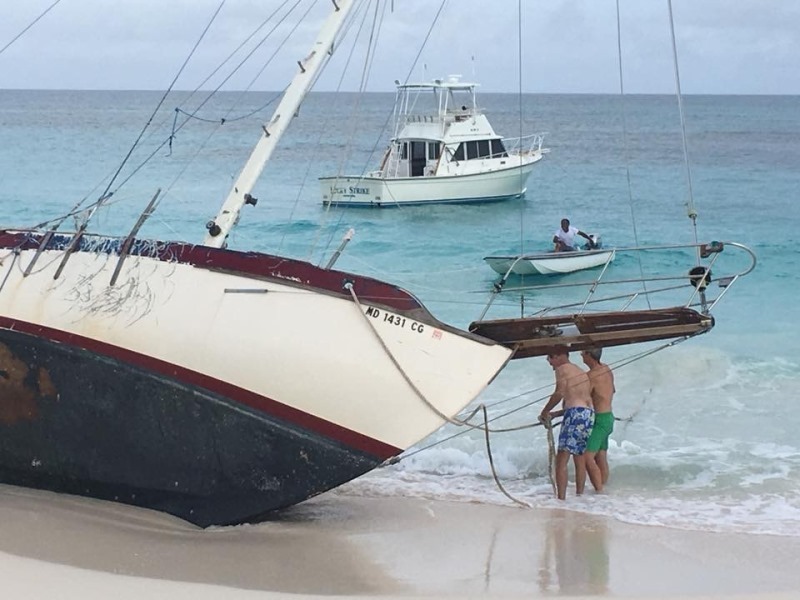 Update on the BOLO boat beached on Elbow Cay, oceanside: After she was stripped, efforts were undertaken to drag the hull out to sea and sink it. First she was pushed down the beach and rolled over, bow out. Then attempts were made to pull her off the beach. Turned out she’d taken on so much water, she was too heavy. Pumps were brought, but not before the 30+ onshore winds arrived, bringing a halt to the entire project. More later. P.S. Randy the Manatee is free of his red top coating. He was at the marina when I went in to do laundry today, looking his gray self again. Love the blog! Congrats on winning the raffle, you look fabulous Nancy! Glad Randy’s back to normal!